One of the best things about modern hair trends is that fewer and fewer things are being considered off limits. 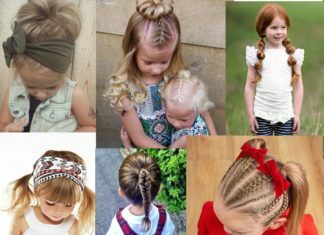 Men are wearing long hair in buns and braids, while women are stepping out in shaved styles and outrageous colors. 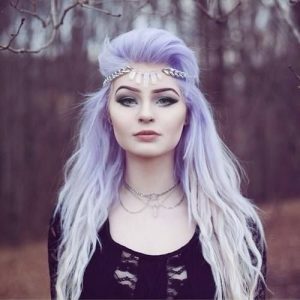 Lavender, the most dramatic of the trendy shades, is a hot color that can be tough to achieve, but well worth it once you’ve got this standout color on your head. For ideas about how to make purple hair work in your life, here are thirty of the best lavender looks. 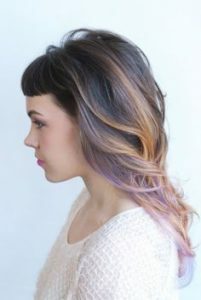 For a bright bit of lavender that will remain mostly hidden when hair is down, try this sneaky lavender color purple highlights on the lowest section of your hair. 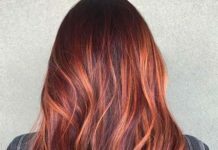 Great for anyone who wants to keep some of their hair natural, or as a starting point for testing out color on home dye jobs. This blonde purple hair color job takes hair from a platinum root with tinges of lavender down to pastel purple ends in a perfect, easter egg shade. Combined with the length of these locks, the overall look here is pure fairy princess, so don’t be surprised if people expect you to be wearing sparkles and wings to match. 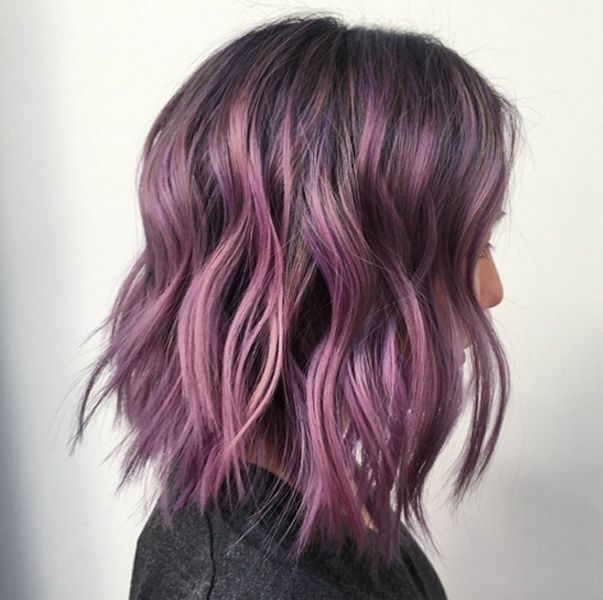 Hosting a variety of hues from lavender to grape to mauve, this shoulder-grazing cut mixes lazy waves with energetic color. 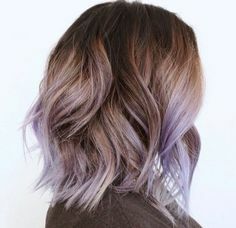 Featuring a light, barely there lavender shade at the roots and a bright, jewel tone purple at the ends, this style is a perfect example of balayage in anything but subtle shades. One of the more subtle styles on our list, this look features a brushed on lavender color for an end result that’s purple without being too powerful. 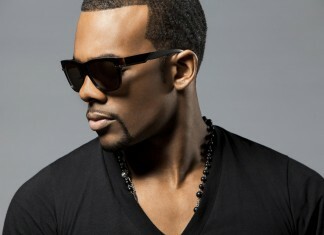 Not only is this look easy to style on a day-to-day basis, but growing hair out is a painless affair. 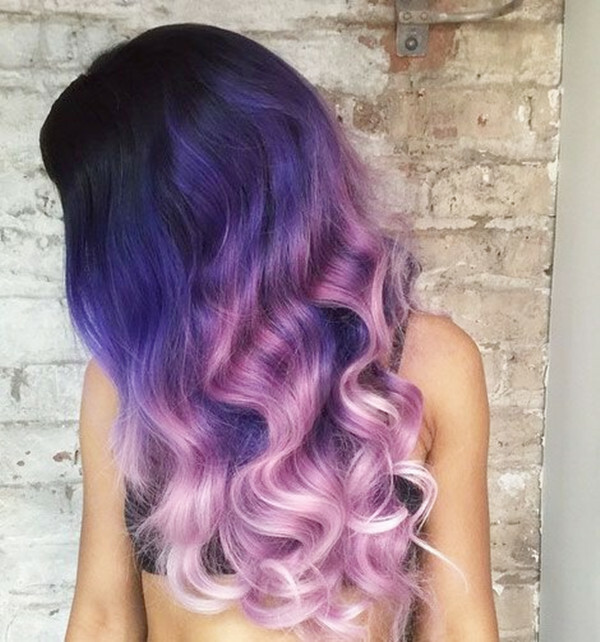 What happens when two out of this world colors are combined on one head of hair? You get this tripped out ice cream swirl of cool pastel pigment. 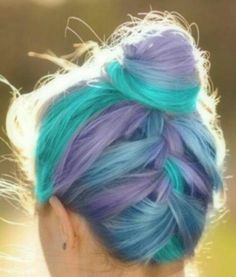 Any braided style will result in a nice intermixing of two colors, but this braid underneath the bun is perfect for when your purple and blue masterpiece needs to be up and out of the way. As much as you can call a head of purple hair classic, this style keeps it simple with an allover amethyst shade on long, cascading curls. Perfect for if you’re torn between loving purple hair and wanting to look like a resident of planet Earth. If somebody tells you that you can’t wear lavender hair as a bride…don’t invite them to your wedding! This loose fishtail braid complete with burnished metal and silk flower headpiece perfectly encapsulates the modern bride: elegant, edgy, and not interested in dulling down individual style on her big day. You may never have the chance to be professionally photographed with hair this beautiful again. Another option for a wedding — yours or someone else’s — this simple and elegant updo gets a little lift thanks to silk flowers and this stand-out shade. Perfect for summer weddings and parties, or your day-to-day look when styled with a frilly blouse and shrunken cardigan. 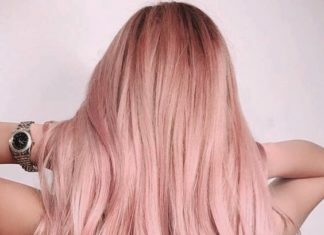 A super easy way to add color to your already blonde hair, the very ends are dipped in pink and purple hair color pastels for a little touch of color that doesn’t take over your whole look. 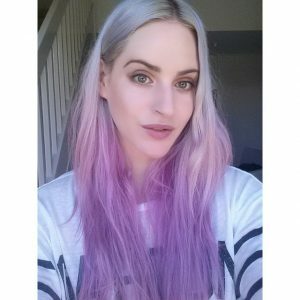 Muted pastel tones are huge right now, but there’s something to be said for this bright, futuristic violet hair color shade. 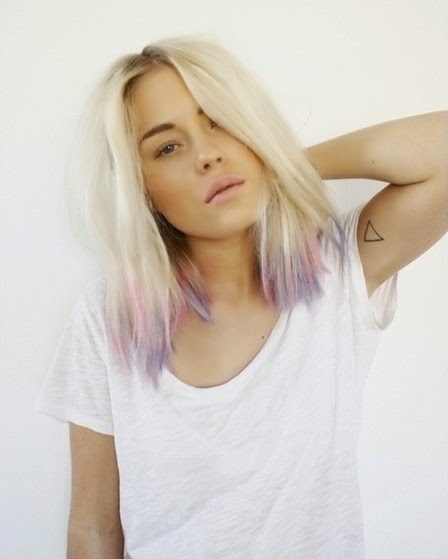 Rather than going for a pastel shade to begin with, start off bright and let the color naturally soften as it fades. 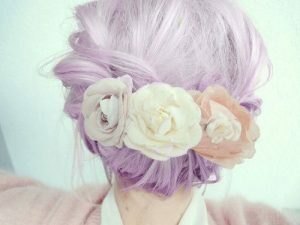 You’ll get more mileage out of your lavender hair as you experience a range of color. Making the most of multiple trends at once, Demi Lovato’s hair is almost as edgy as her outfit. 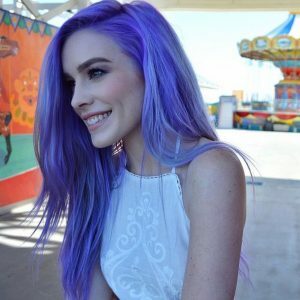 More than half of her brunette hair is engulfed with purple ombre hair, while a side undercut is framed by a skinny cornrow for added style factor and a practical barrier to keep hair from falling over it. Another tip to take from this look: don’t be afraid to wear pink lipsticks with purple hair, this contrasting shade is actually more flattering than a matchy burgundy or currant lip. 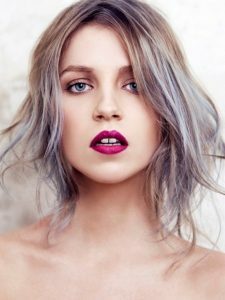 This grey/silver lavender shade gives off major witchy vibes and combines two of the biggest trends in hair color: grey and lavender. Perfect on any hairstyle, just as long as you’re ready for an influx of envious questions about who your stylist is. 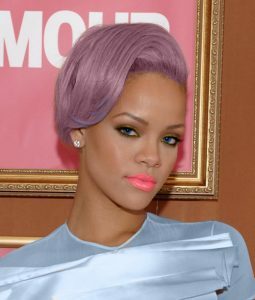 Not only does this lavender shade look perfect against Rihanna’s skin tone, but she’s styled it with a vibrant coral lip and blue contacts that has her looking like a futuristic, pop art babe. If you’re looking for a super unique way to wear purple hair, consider this reverse ombre that features platinum blonde ends on a head full of bright, grape Kool-Aid hair. 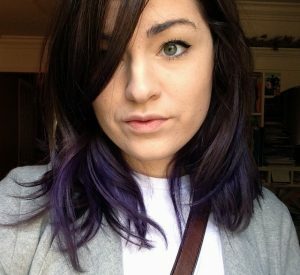 This dark purple shade doesn’t contrast heavily with the natural brunette hair surrounding it, for an end result that’s surprisingly subtle considering you’ve got purple in the mix. 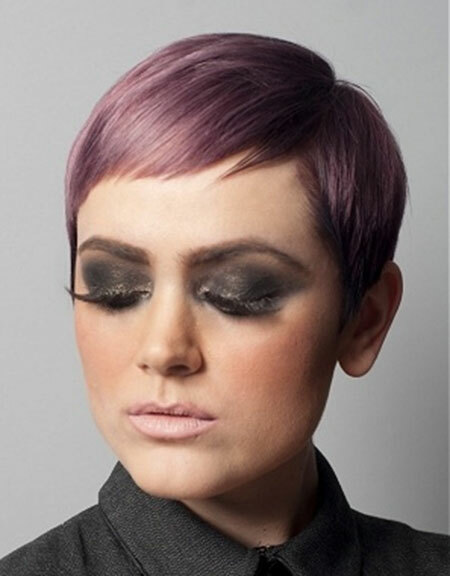 This steely lavender pixie is the perfect modern take on Twiggy and the mod era. Punch it all the way up with this thick smoky eye, or with neutral makeup and a tailored suit for another day at the office. 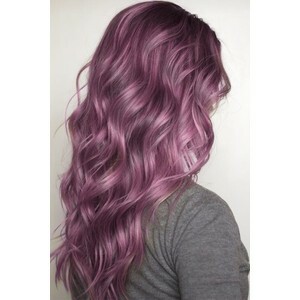 We love this mermaid hair color! 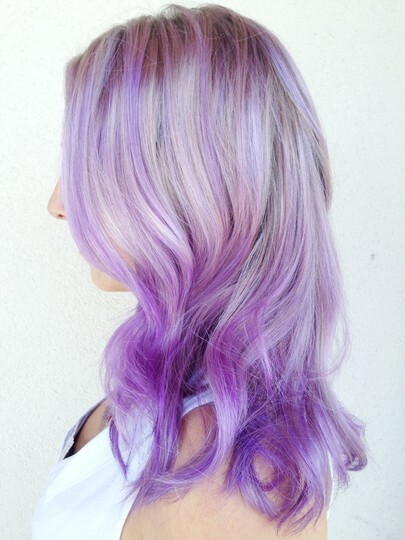 This lavender and platinum ombre features a subtle gradient between two shades that are fairly close together. A perfect hairstyle for when you want to gather up your crystals and head into the forest for the winter solstice. 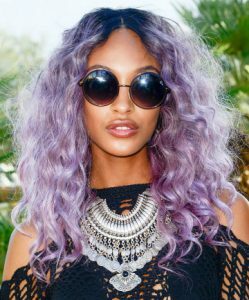 Proving why she’s considered of the new supermodels, Jourdan Dunn stepped out at last year’s Coachella in lavender curls with dark roots and round sunglasses, for a ‘modern goth meets steampunk’ style. 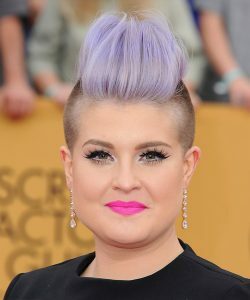 Queen of the lavender hair trend, Kelly Osborne has been wearing some form of the shade for several years. This daring style features hair that’s shaved on both sides, while longer hair on top is styled into a pompadour with tons of volume. Use a root lifting spray and blow dry with a round brush to recreate this height in your own style. 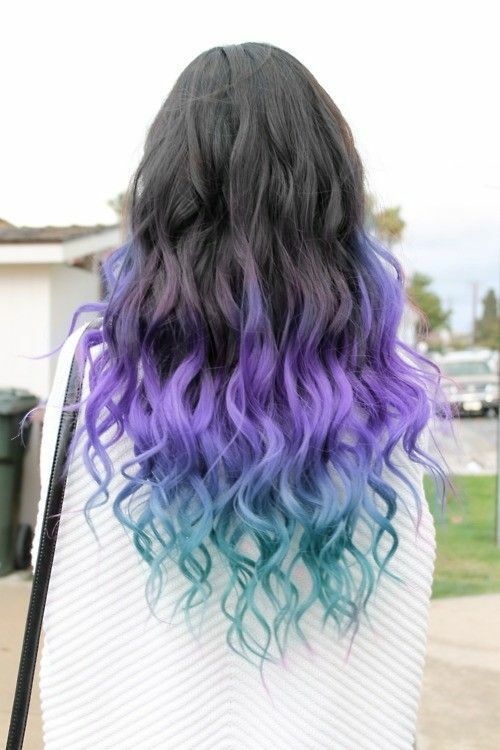 We love this mix of black and purple hair with blue in the middle. 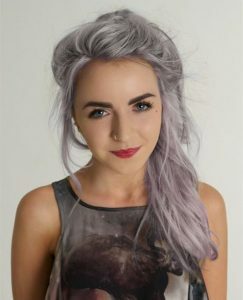 For a lot of purple on one head, this style transitions from jet black to bluish purple to a lilac that nearly turns white at the ends. 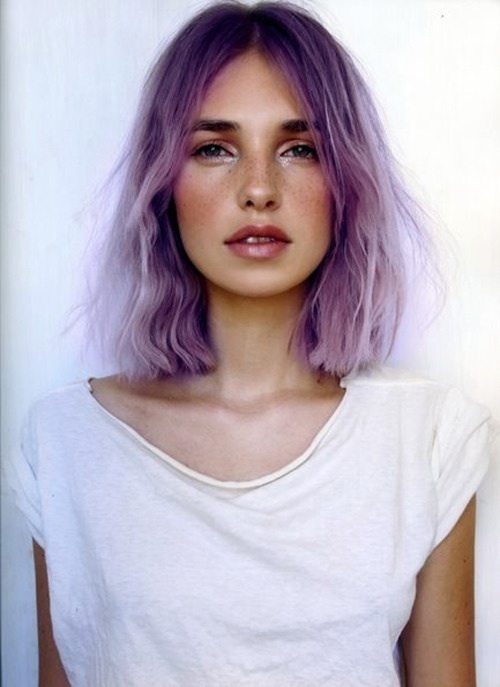 Apart from a few face framing layers, this is a fairly typical blunt cut, and its simplicity contrasts nicely with the intense lavender color. Almost grey on the outside yet a deep amethyst shade at the roots and inner strands, this layered color gives the illusion of more voluminous hair. 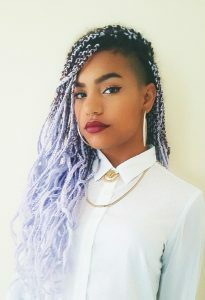 A fun way to get lavender hair without the damage of bleaching, these box braids utilize extensions for length as well as color. Proof that even the tiniest amount of hair can make a huge statement — Amber Rose, anyone? 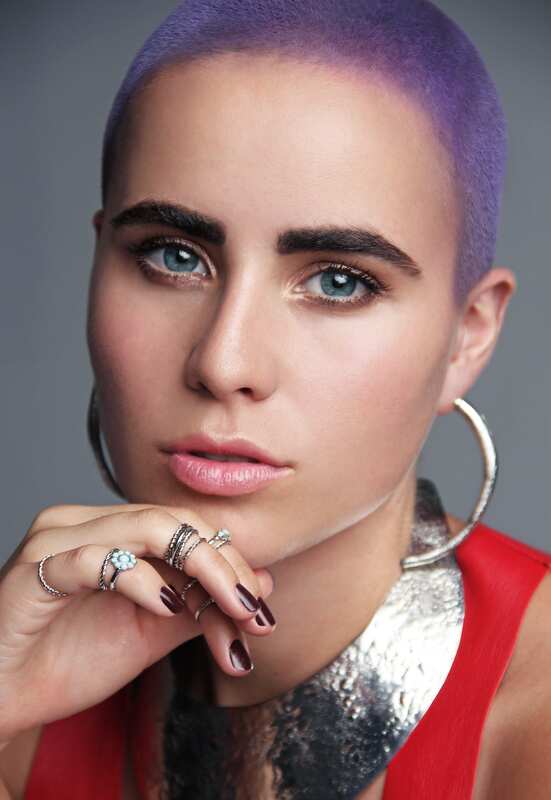 — this lavender buzz cut has massive style impact. 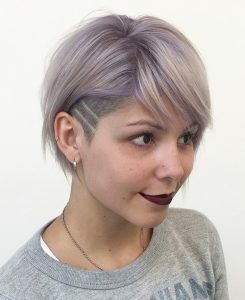 If you’ve been considering buzzing your head but you’re worried about looking feminine, this may be the final push you need. 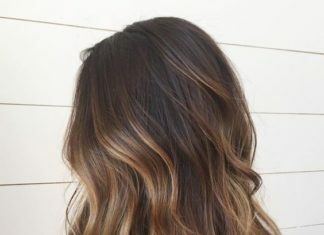 If you’ve been rocking barely-there hair for a while, this is a great way to get a new look without waiting for hair to grow. Another example of purple and teal playing off one another, this style features a lavender and teal ombre over dark brunette hair. 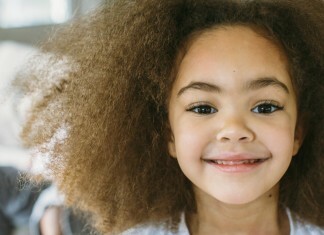 This color combination looks amazing in braids, top knots, or spiral waves as pictured. You could also add another layer of dark purple hair! This short light purple hair cut features textured ends and side swept bangs for a look that’s feminine and spritely. 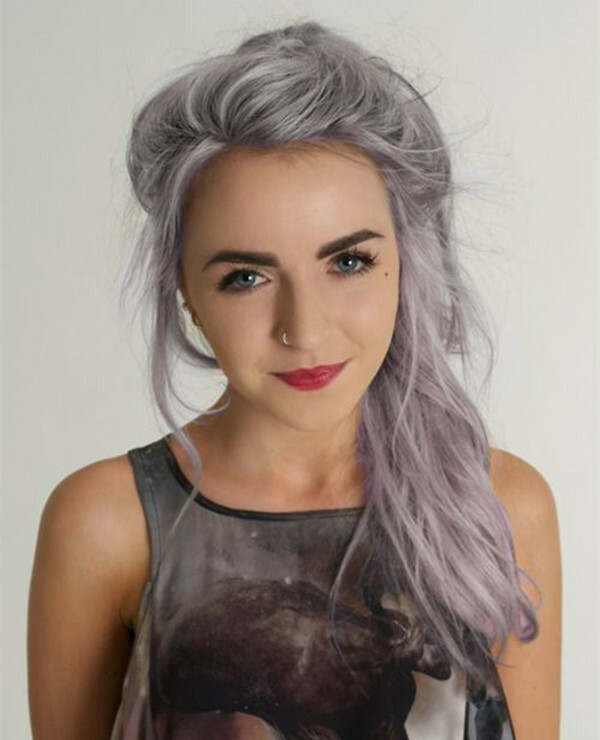 This particular style leaves some strands blonde, giving a smoky quality to the pastel lavender. 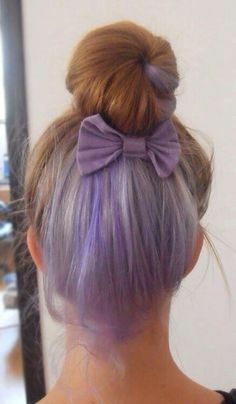 If you try an all-over lavender that doesn’t end up adhering to all of your hair, consider this result a happy accident. We’ve seen Nicole Richie develop into a fashion icon since her days on The Simple Life, and she continues to make daring, trendsetting choices that blur the line between sophisticated and edgy. 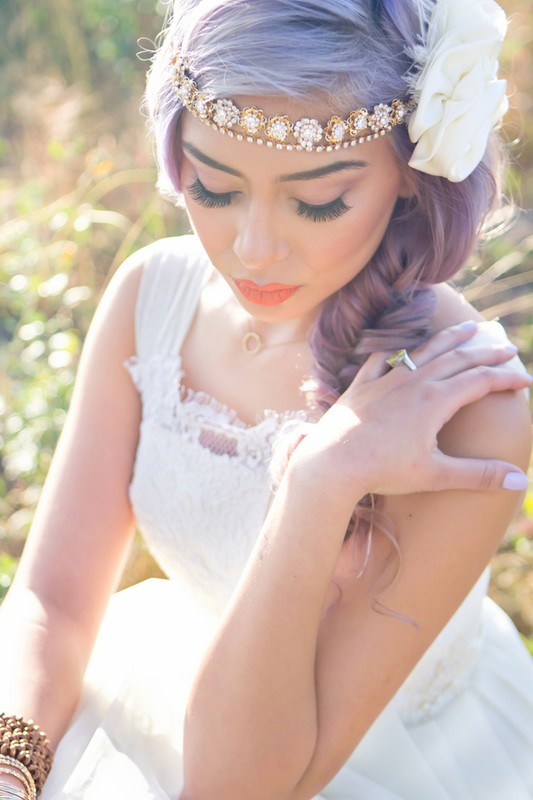 Her turn with lavender hair being no different, Nicole wore the fairytale color with vintage pieces, feminine braids, and chunky statement jewelry. 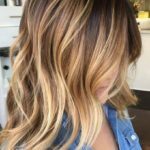 Sticking with a natural brunette color on top, this style sees peach and lavender purple highlights brushed on throughout using the balayage technique, for an end result that’s like a gourmet summer desert. Known for being a hair chameleon, Katy Perry is never one to shy away from a new style or color. 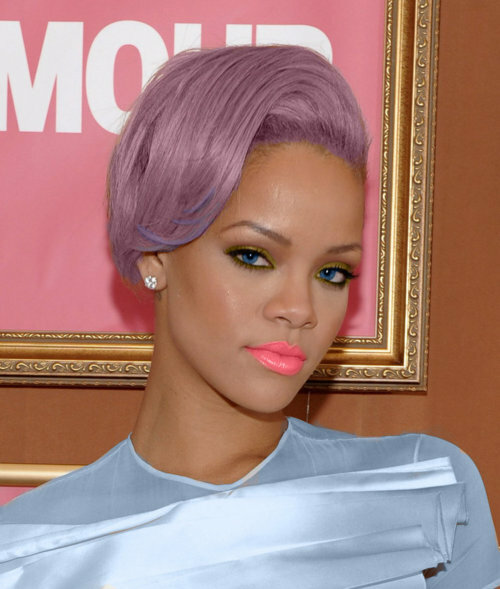 Her take on the lavender trend is interesting in how it mixes the extravagant color with a romantic curled bob and sequined glam dress. 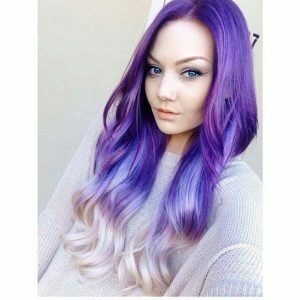 Another style with only hints of purple, this dirty blonde hair has been lightly kissed with a bluish lavender shade for a frosty chic look.